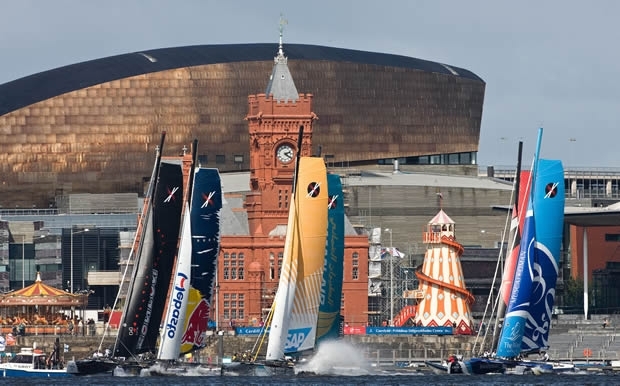 Big gusty conditions in the confines of Cardiff Bay ensured that the opening day of Extreme Sailing Series racing in Cardiff, Wales was action-packed for the nine Extreme 40s. With the boats reaching out of the starts off the VIP area, Austria’s Red Bull Sailing Team made the best of the tight courses, putting double Olympic Tornado gold medallist Roman Hagara’s crew at the top of the leaderboard at the end of day one. For local entry, Team Wales, skippered by young Welsh 49er sailor Dave Evans and with 470 Olympic silver medallist Hannah Mills calling tactics, the day ended in drama when the 62ft wingmast came crashing down to leeward. The dismast is believed to have been caused by a component failure on the mast. However the carbon fibre remained intact and they will be back on the water tomorrow – after what is sure to be a long night for their shore team. Today was about supreme boat handling and minimising mistakes and both Oman Air and GAC Pindar did just that to end the day in second and third respectively behind Red Bull Sailing Team. The Extreme 40 fleet was joined by a host of sports stars today that turned their hands to Extreme 40 racing for the first time. Ex-England cricket captain Michael Vaughan joined Andrew Walsh’s team on GAC Pindar, while some of Britain’s top sailing talent including Team Volvo sailors and Olympic silver medallists Luke Patience and Saskia Clark, 2008 Olympic gold medallist Paul Goodison and Team GB match racing sisters Lucy and Kate MacGregor. The event officially opens to the public tomorrow with thousands expected to descend on Cardiff Bay to witness the stadium style racing for the first time. All the action will be streamed live on the official event website with expert commentary from sailing expert Richard Simmonds from 1500 local time.